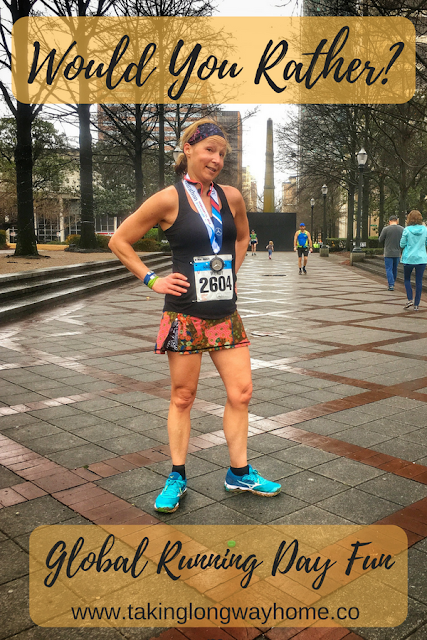 Run with no socks or no sports bra? Probably no socks. Even though I'm not well endowed, I hate anything bouncing while I'm running. That's why I don't wear a fuel belt. It's all so distracting. Run a mile naked or in a snowsuit? Snowsuit! I used to wake up from a recurring dream that I was walking around work naked. No one needs to see that, much less imagine it. Plus, it's all about the cute running gear for me. Run in the freezing cold or sweltering heat? Team Cold Weather. As much as I hate winter, I don't do well running in the heat. Run with an empty stomach or a full bladder? Empty stomach. I'd be distracted by the full bladder and it would also be very uncomfortable. 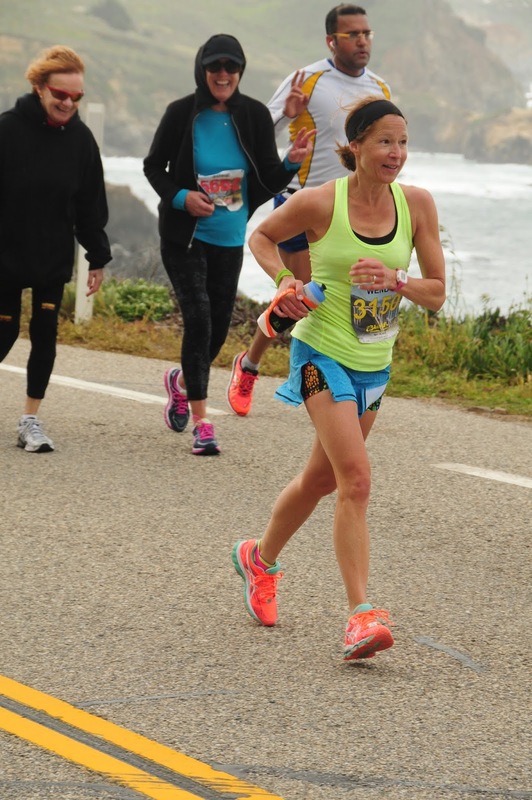 Run uphill or into a headwind? I'd rather run uphill. While I don't love hills, they don't affect me like the wind does. Of course, you don't always get a choice. Big Sur had both! 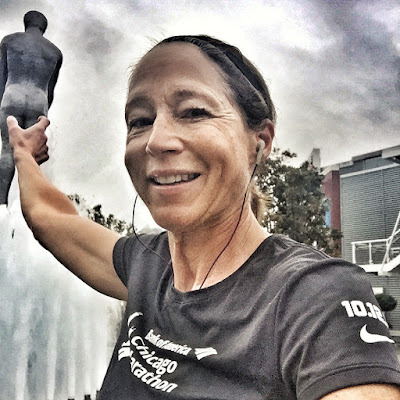 Run without music or without a GPS watch? I could do either, but I'd rather leave my watch at home. Music helps pace me and I'd probably do just fine without my watch. Skip deodorant or Body Glide? Body odor vs chafing? I know which is the lesser evil for me. I'd rather smell bad than chafe. Washing away the smell in the shower would be painless. Chafing, not so much. Run as much as you want on the treadmill or only once a week outside? I'd rather run outside. Quality over quantity. Run a beer mile or a color run? 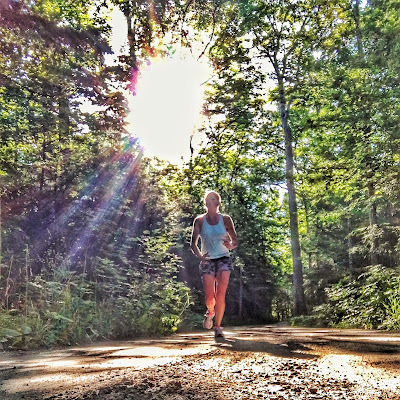 Run on a trail or the road? Trails. Hands down. Even a city trail with sculptures. Run an out and back or a loop? I've passed on races just because the course is out and back. I'd much rather do a loop course. 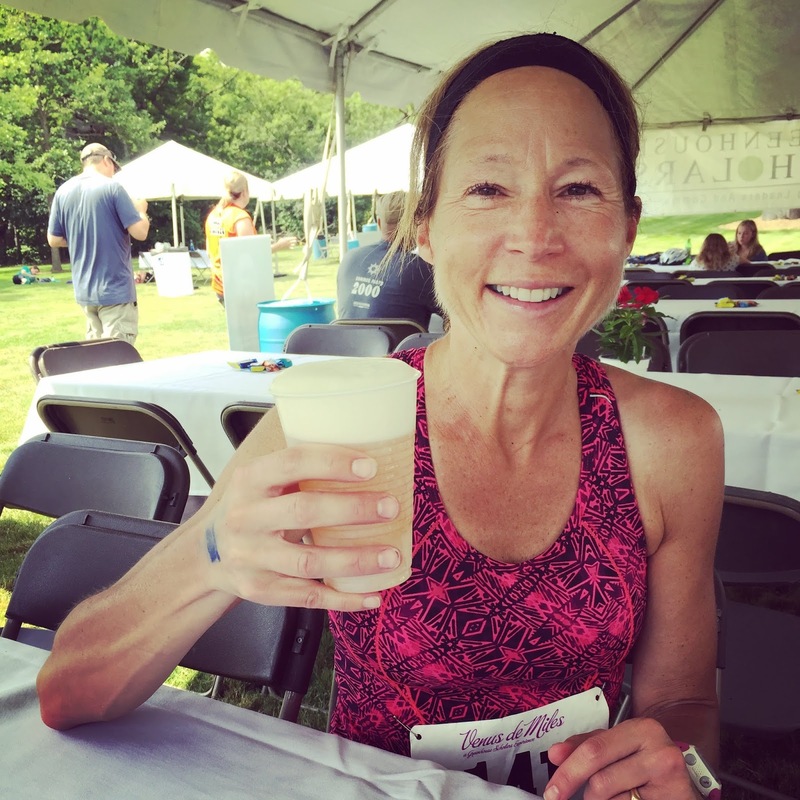 Eat a slice of pizza mid-race or drink a milkshake? I'd probably do better with the pizza. Run in the rain or snow? Snow! I love snow runs. I've been known to run in a blizzard. With my spirit animals. Beer or chocolate milk at the finish line? Did you say beer? I can't think of anything that tastes better after a race. What would you rather? Pick a couple questions and answer in the comments! Did you run for Global Running Day? 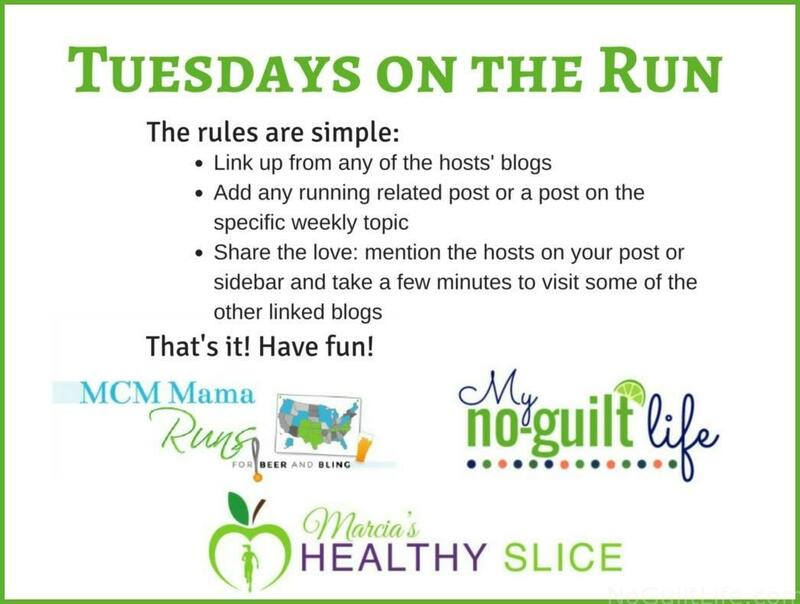 I'm linking up with Marcia, Erika, and Patti for Tuesdays on the Run and Debbie and Lora for Coaches' Corner. No music (cause that's the way I run anyway, LOL). No socks. Although I'd hate it -- I don't get how people run without socks. I don't have much up there either but it still needs some containment. Cold, any day. While I don't like the cold, heat is definitely not my friend. Although the SS Cool It Skirt really does seem to help a lot with that! You do love your SS skirts!! Glad we're having the kind of weather that lets you show them off! 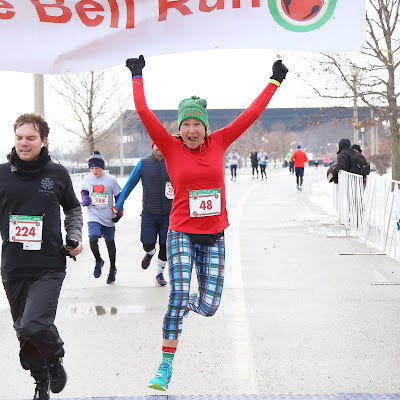 Because running is awesome and hilarious, right? This is fun! I may do it for myself tomorrow too. Happy global running day! Yes! It would be fun for people to do this! I had to laugh at the very idea of running without a sports bra. I'd hurt myself! I thought GRD was tomorrow? It is tomorrow--I just got ahead of myself! 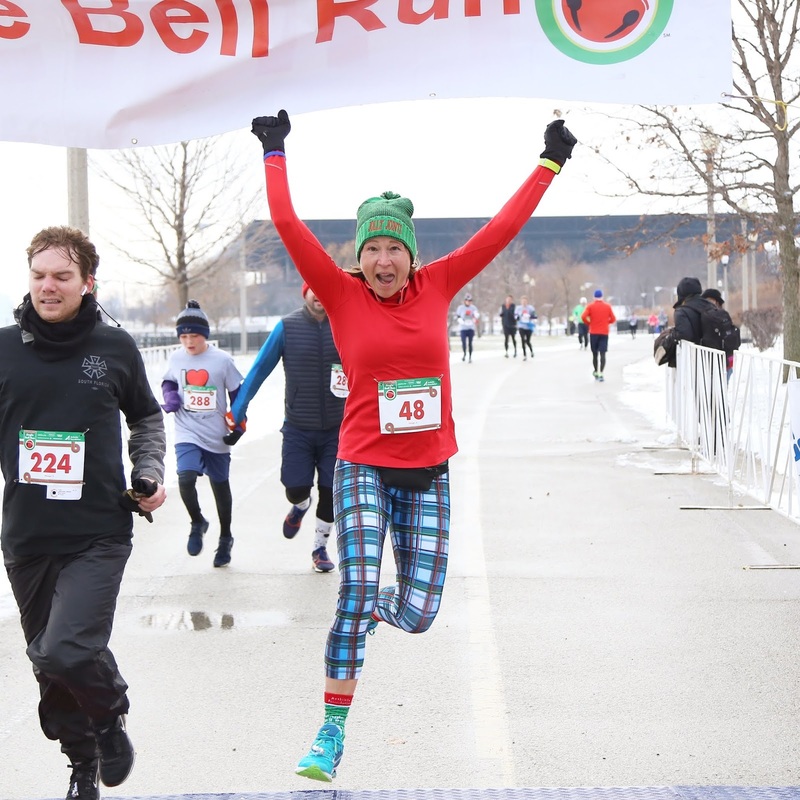 Is global running day Tuesday or Wednesday? I was hoping it was tomorrow since I'm sick today and probably won't run. If I could, I would run without socks every day. I actually hate the restricting feeling of socks. The o my problem with running sans socks is that I get blisters on the top of my feet! I always prefer trail running or a nice path opposed to running on a road. 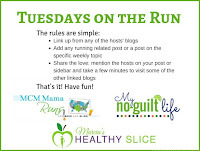 GRD is tomorrow--I just wanted to make the Tuesday Link up! I agree with most of your picks! There's something about out-and-backs, especially in a race, that I really loathe. Tough mentally. It's really hard seeing all the people coming back at you. At least with a loop you don't know how many people are ahead of you. We had the same preference on many of these, but I am not a beer person, so I'm opposite for sure on those questions. As for global running day, I'm currently injured, so I am going to PT to celebrate (and try my best to get back to running soon)! Definitely no socks - I have skipped a run before because I forgot the sports bra. And can I choose neither on beer mile vs color run? I'm with you on the powder packets, and I couldn't drink that much beer even when not running! I've done a color run, with my mom. It was fun, but not something I'd do again. I don't like beer either. Since I just did Bay to Breakers and saw naked participants, all I could think of was no wonder they're not running. Certain body parts need support! I would think that gravity is not a naked runner's friend! I think I agree with most of your answers! Though I'd have to stay away from the beer mile. I think that would have unpleasant results for everyone around. That photo of you with the dogs is amazing! Haha! I think the beer mile would be unpleasant for most people! Oh I am definitely doing this post tomorrow! I'm weird..I actually want both chocolate milk (as soon as I'm done) and beer (to celebrate)! I probably shouldn't, but hey, life is short! Fun survey! I agree with many of your answers. Most days I actually don't even wear deodorant when i run in the morning. I figure I'm by myself so no one else will smell me! Right? I only put it on after I shower. Sorry, not sorry! Team Cold Weather all the way! Fun post! I'm Team Cold Weather, too, and chime with most of your choices - except I'd choose my watch (I'm a transcriber so I like to be frreeeeee of headphones when I run); out and back (because I can see all the people who are in front of me); rain (because I'm scared of slipping); and chocolate milk (actually banana milk). I actually had a second good run in a row yesterday on our club run, after discovering that my blood pressure meds (which I've had to reluctantly go back on) have been affecting my energy levels and messing up some runs. So that's good! I'm so glad to hear that you're running well again! I didn't realize that the BP meds would affect you like that. I did some research and beta blockers like the ones I'm on can really affect your running. I got quite panicky about that! But I do seem to have adjusted to them now, as I am running just as usual after a dodgy patch. Phew! I agree with most of your answers, except I am on team hot. I love running in the heat. Sweating makes me feel like I am accomplishing something. I therefore would rather run in the rain than snow. I am going out trail running with a buddy this morning. Team hot, huh? While I like to sweat, I can't run as well in the heat. I wish I could! This is fun! Aside from the weather thing (and only because I' used to the heat) we pretty much agree. Except I don't listen to music when I run anyway, so I guess I'd give that up. Though since I pretty much know all my mileage anywhere, so the GPS is hardly needed anymore. No socks, in the heat, milkshake, chocolate milk! Fun post idea! 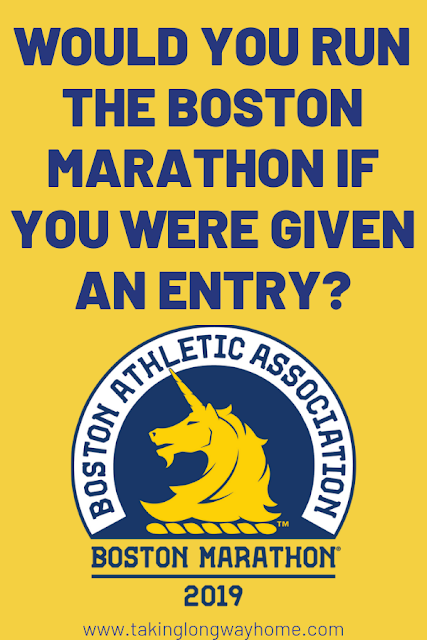 I can't take the credit for the idea--it's been done a few times by other running bloggers! The heat makes it hard to run, doesn't it? But I'll take warm weather in general over cold. Are those your pups? Super cute for sure! I am team cold weather for sure. We don't get much of it here but I'm always out there. I wouldn't run naked because of the chafing lol. I'd go deodorant free all the time if it meant I never chafed again! They aren't my dogs--they are my neighbors'. They're therapy dogs and they are amazing animals! How fun! Color runs are kind of annoying but I can't imagine doing a beer run. Beer afterward is fine (and normal LOL) but the bubbles would not sit well with my stomach during a run. I actually don't know how I'd do with beer on a run. I've never tried it! Agree that a cold beer tastes amazing after a race. Also SOCKS-same answer as you, despite being smaller chested I couldn't deal with any movement up there. I'm super self conscious about smelling and have actually forgotten deodorant on a couple occasions to morning workouts because I wasn't awake yet-if I'm solo I'd say deodorant but with other people I'd skip the Body Glide instead! The deodorant vs chafing question was a dilemma! but I've had such bad chafing that I had to pick no deodorant! It was fun to see everyone's answers! Wait whose dogs are those?! Huskies and Mals are my fave. We just adopted a lab/husky. She's the cutest ever. My neighbors own them. They are therapy dogs and they are amazing!!! They get so excited when they see me running. I'm thinking the same thing! LOL! What crazy person came up with these questions!! Naked vs. Snowsuit?? I think I'd run my fastest mile yet naked! I hope you had a great event today! I would definitely ditch my music in favor of the GPS watch. And have a piece of pizza mid run rather than a milkshake. Fun questions! I chafe in all sorts of spots--but my thighs are number one! This is great! And I'm in agreement with all of your picks - especially running in the cold! Running in the heat and I are just not friends. I'm not a fan of hot weather running at all. What can I say?